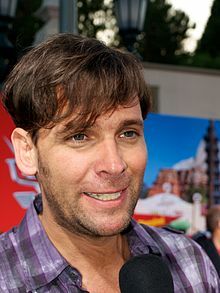 Juan Patricio Borghetti Imérito (Spanish pronunciation: [ˈxwan paˈtɾisjo βoɾˈɣeti iˈmeɾito]; born December 5, 1973 in Buenos Aires) is an Argentine actor and singer. At the age of fourteen, he formed his first rock band, which was called "Sur" ("South"). He later worked as a model and appeared in some episodes of Argentine telenovelas. In the mid 90's, Borghetti arrived in Mexico, where he later starred in the musical telenovela DKDA, in which he played Axel Harris, his first stellar role. He has also participated in El Juego de la Vida and Rebelde. He is currently participating in Atrevete a Soñar, and Esperanza del Corazón. He previously participated in Teresa (2010 Telenovela). He had a romance with Mónica Noguera in the late 1990s. He was married to actress Grettell Valdez, divorced in 2010. This page was last edited on 3 February 2019, at 09:58 (UTC).